Type design goes unappreciated by most, but for designers, being all all-star in type design is a bit like being a big-wave surfer or a base jumper: It commands respect from your in-the-know peers, because the discipline is insanely difficult. Every font is a minefield of decisions, against myriad concerns like legibility, expressiveness, historical references (which are crazy, considering that many typefaces are hundreds of years old). But at the same time, a good type design can scream talent even to the layman. 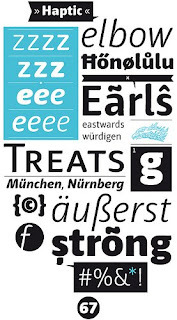 Here's a peak at a few nice ones, courtesy of the Type Director's Club 2009 awards, one of the most prestigious in the world.